Bill Dedman & Paul Clark Newell, Jr.
Pulitzer Prize winning investigative journalist Bill Dedman and Paul Clark Newell, Jr., a cousin of the book's subject, reconstruct the life of reclusive copper heiress Huguette Clark (1906-2011) in this riveting biography. The authors bring Huguette's odd past into clear perspective, including the hilariously corrupt political schemes of her father, W.A. Clark, who was a Montana senator. Though less celebrated than his compatriots Rockefeller and Carnegie, W.A. Clark was at a time wealthier than they, and by extension, so was his daughter. She was a regular in the society pages during her youth and even married for a short time, Clark later slipped into her own world and stayed there, quietly buying multi-million dollar homes for her dolls. Kind and unspeakably generous to those who worked for her and usually suspicious of family, she wrote a few big checks to people she hardly knew. Other family acquisitions, valuable musical instruments and jewelry among them, she simply gave away. The authors provide a thrilling study of the responsibilities and privileges that come with great wealth and draw the reader into the deliciously scandalous story of Clark's choices in later life, the question of Clark's presence of mind always at issue. 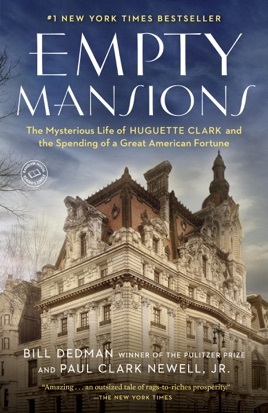 Hewn from Huguette's stories, purchases, phone calls, gifts, and letters, the tale of where and how Huguette Clark found happiness will entrance anyone. An unusual but not sick world of an eccentric and very wealthy woman. The authors, like many of the people touched by Huguette, are respectful of her. The book does a good job with the life of a wealthy Guilded Age family through Huguette's long life until her death in 2011 at nearly age 105. This book is definitely thorough!! So thorough that at times it was a bit much to take in, but one can appreciate the research that went into compliling an immaculate look at a very perplexing figure's life! The numbers presented alone are staggering and incomprehensible! However, I found one small statement in the book to be a medically unsound assumption. I would like to point out from a clinical standpoint that the condition of aphasia (which a surviving relative reportedly suffered from) indeed is not at all "akin" to dementia. It is true that some patients who have aphasia also happen to have dementia, but aphasia does not cause dementia and must be viewed as a completely seperate illness. For the hundreds of aphasic patients I have treated as a speech pathologist, a vast majority are mentally intact and painfully trapped within their own sharp minds due to their communication impairment. To assume that because one cannot verbally (or nonverbally) communicate is indicative of a diminished cognitive status is just as poor an assumption as Madame Clark's eccentricities being a result of mental handicap/illness. I can see how that tiny tidbit slipped through the cracks given the volumes of facts that had to be researched, but I simply could not let the misinformation go unattended. Ignorance only empowers the ignorant and individuals with communication impairments richly deserve our advocacy and understanding! Misinformation aside, my kudos and thanks to the authors for bringing to life a compelling and hidden piece of history! What a beautifully grand lady. Thank you for this enthralling read. I simply couldn't put it down.